Refugees and asylum seekers raised concern over limited opportunities for economic inclusion in Kenya. They raised these concerns at a community forum organized by the Refugee Consortium of Kenya (RCK) held on Tuesday 22nd January, 2019 in Kawangware, Nairobi City County. The aim of the forum was to sensitize the forced migrants on their rights and obligations with respect to working in Kenya. Thirty three of them gathered at the Maisha Poa Centre to interact with RCK officers on right to work with specific focus on access to work permits. They were mainly drawn from the Great Lakes Region and South Sudan. Nairobi City County hosts 75,742 refugees as at 31st December, 2018. Despite the existence of an encampment policy in Kenya, some refugees are allowed to live in the urban areas. Some of the reasons allowing refugees to reside outside the designated areas include accessing education and specialized medical attention. Refugees and asylum seekers who are allowed to live in urban areas must have the ability to sustain themselves because services such as provision of food and non-food items such as shelter are mainly provided in the camps. Therefore it is crucial that they engage in income generating activities to sustain themselves. To do this legally, they require a work permit to achieve this. In light of this, refugees and asylum seekers who attended the forum at Maisha Poa were informed of the various provisions on the right to work. They were informed that they require a work permit to engage in any profession, trade, employment or occupation. “Failure to possess a work permit while working in Kenya as a refugee can attract a fine of Kes.300,000 or a prison term not exceeding 3 years or both” said Andrew Maina the Advocacy, Policy Development and Governance Programme Officer. He was referring to section 53(1) (m) of the Kenya Citizenship and Immigration Act, 2011. Participants at the forum were allowed to raise issues that they felt were hindering them to access work and business permits. One of the issues raised was that the process to access a refugee certificate and the refugee status determination (RSD) process, was too lengthy. One of the representative said “how can I access a work permit when the law states that I require a refugee certificate but this certificate takes five years to get? What will I do in the meantime?” This concern reverberated form several other comments that were raised by subsequent speakers. Refugees also took issue with the required process to access the work permit. They decried the requirement of presenting an employment letter from an employer. They said that most employers they had interacted with were afraid to give them these letters. “Some of these prospective employers are afraid to give us jobs while there are Kenyans that can take up those positions. Moreover the employers often insist that the refugees provide proof that they can work in Kenya legally before issuing an employment letter,” said another refugee participant. 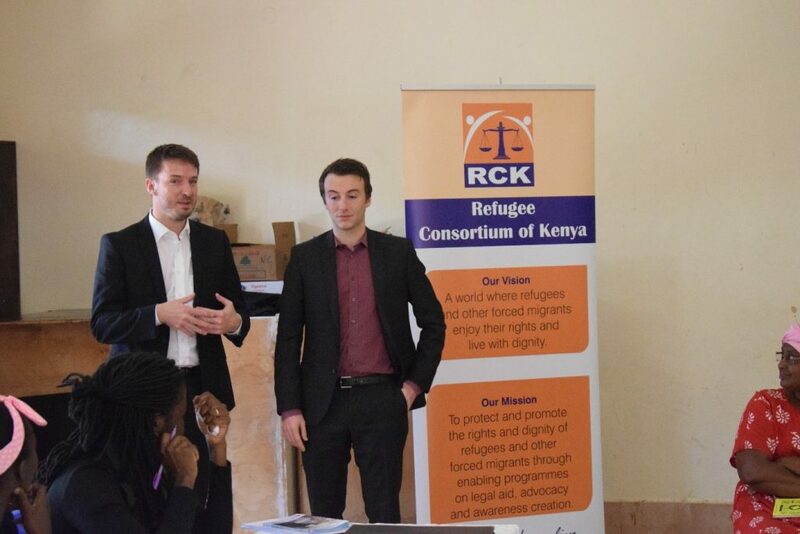 In order to ensure refugees access economic inclusion opportunities, Refugee Consortium of Kenya (RCK) has robustly engaged in advocacy for access to documentation by refugees through provision of technical and legal assistance in application of work permits. 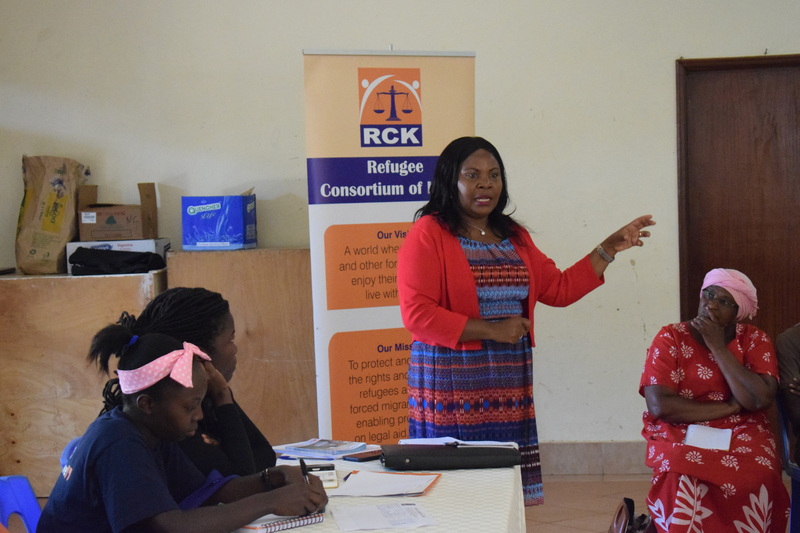 The RCK Executive Director, Ms. Eunice Ndonga Githinji informed the participants of the services that the organization offers to address some of the issues that the refugee raised. She stated that RCK provides legal support for asylum seekers to fast track RSD cases. “RCK also provides technical support for refugees that qualify to be granted work permits in Kenya,” Ms. Ndonga said. She also mentioned that solutions to some of the issues raised by the persons of concern would be addressed through the legal and policy framework review process that is on-going. Ms. Ndonga added “We are members of a Government led task force that is reviewing the Refugees Act, 2006. One of the areas that we are looking to improve in the law is access to economic opportunities for refugees. At the meeting were representatives of the Human and Security Division (HSD) of the Federal Department of Foreign Affairs of the Swiss Confederation. They joined RCK staff to the forum to get first-hand information aboutthe issues refugees and asylum seekers had with respect to accessing work and business permits. HSD has been generously supporting RCK’s work in addressing the challenge of economic inclusion of refugee in Kenya. The forum ended on a good note with refugees and asylum seekers freely mingling with staff. They expressed their appreciation with RCK’s work despite the challenges they face in the urban area. They also encouraged RCK to have more of these sessions in order to educate refugees and asylum seekers on their rights and duties. 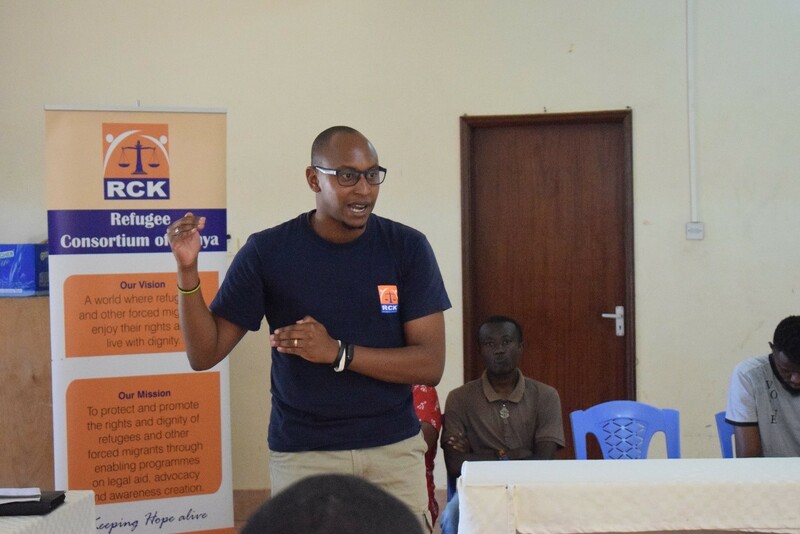 RCK shall continue carrying out these sensitisation forums to raise awareness among refugees and asylum seekers on importance of documentation and the legal requirements for such documents.